Back in the 1980s, a self-help relationship book was on many a must-read list. It was called A Fine Romance, and it described the five stages of a relationship: Selection, Seduction, Switch, Negotiation, and Commitment. This may seem like a stretch, but the IT industry goes through something similar with new technologies, at least according to Gartner’s just-released annual report on the Hype Cycle. Which, it’s worth mentioning, is a Gartner meme second only to the Total Cost of Ownership in terms of how often it’s referenced in the IT industry. Like relationships in A Fine Romance, technologies pass through five similar stages: Innovation Trigger, Peak of Inflated Expectations, Trough of Disillusionment, Slope of Enlightenment, and Plateau of Productivity. All new technologies go through these stages, through no fault of their own. Technologies get overhyped; people are inevitably disappointed that they don’t live up to the hype. Eventually, the technology is viewed more realistically and everyone figures out what it can actually do for their business. 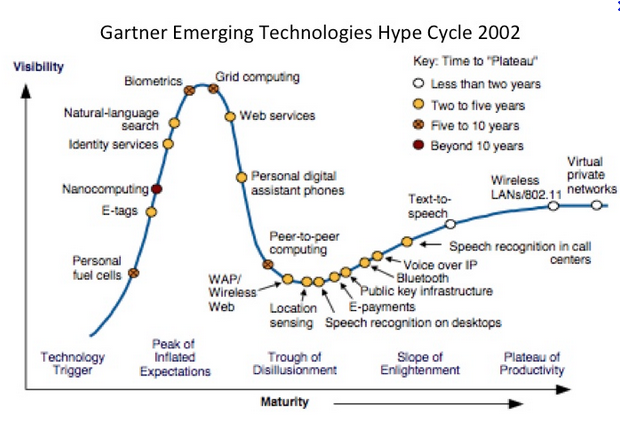 For instance, in 2005, the technology at the very top of the Hype Cycle was Business Process Management (BPM) suites. Now, almost ten years later, BPM has certainly lived up to the hype. But that same year, the technology at the very bottom was tablet PCs—which ultimately emerged as valuable devices in organizations. Similarly, in 2002, “personal digital assistant phones” were on the decline, which is probably pretty amusing to those of you reading this on your smartphone. Naturally, people are always dying to know which technologies are on the “top” and which are on the “bottom.” So, for 2014, the technology on the very top is the Internet of Things—which shouldn’t be a surprise to anyone—while cloud computing is at the bottom. And Big Data, which was near the top of the peak a year ago, is now sliding down the curve. When it lands at the bottom of the trough in the next year or so, we might actually be able to determine what it’s really good for. Incidentally, much of the media coverage around this year’s Hype Cycle is devoted to pooh-poohing it, and questioning its relevance. One could argue that the Hype Cycle itself is entering its own Trough of Disillusionment, after having reached the peak. Given that the Hype Cycle isn’t really predictive of which technologies will ultimately live up to expectations, as its critics noted, is it valuable or not? Sure it is. In the same way that A Fine Romance reminded us that it’s normal for relationships to go through highs and lows, the Hype Cycle reminds us that other people may be feeling disillusioned with a certain technology, too. 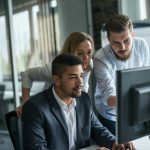 It can be validating to see that others are struggling with how Big Data will live up to the hype in their organizations. The Hype Cycle is most useful when it’s viewed as descriptive, not prescriptive. The fact that a particular technology is at the peak of the Hype Cycle, or the bottom of the trough, doesn’t mean that there’s anything wrong with the technology. Good technologies, products and vendors all go through this cycle. Just because some poor technology happens to be in the Trough of Disillusionment doesn’t mean it should be dropped or dismissed. 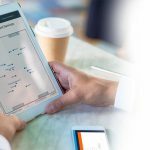 Indeed, Gartner analyst Mark Raskino noted that part of his job was to bolster sagging confidence at different stages of a new technology’s Hype Cycle, as well as try to dampen over enthusiasm at the peak. In other words, yes, there’s still hope for cloud computing. Wait until next year!